Just a quickie to say that the editors of Vol IV of Beckett’s letters contacted me recently to confirm that I was the Anton whom Beckett mentioned in a letter to Jocelyn Herbert in the early 1970s. At the time I was assisting Sam on a production of the premiere of NOT I at the Royal Court, and he very kindly said he’d have a look at a play I’d just written. When he’d done so, he gave it back and told me he thought it was ‘repetitive, but then so were some of my early efforts’. I directed the play at the Theatre Upstairs a few months later. Luckily for everyone, it has never been heard of since! Just a quick note to say all you book lovers can register for World Book Day 2016 now…What is it?! The website link is here, happy reading! This week’s stories about Amazon’s new payment method – “Pay-per-page: Amazon to align payment with how much customers read” was the headline here – gave the impression that the system would apply to all self-published authors whose books are available on Kindle, and that their royalties would be brutally cut if readers didn’t get very far into the book. At first blush, it looked bad, and my first reaction was anger. The reality proved more complicated. The new method of payment doesn’t apply to books that have been purchased but to those that are borrowed as part of Kindle Unlimited, which allows for – you guessed it – unlimited reading of KU books in exchange for a subscription fee. Self-published authors can opt in via Amazon’s KDP Select programme, which gives them a cut from a fund calculated by Amazon on a monthly basis: for June 2015, it’s $3m (£1.9m). This naturally puts a cap on author’s earnings, as they can never earn more than the fund allows and are competing for a share with all the other authors on the programme. Amazon used to start paying royalties on the borrowed book once a reader got to 10% of the way through, but this was proving unfair to authors who wrote longer books. A reader perusing a short book reaches the trigger point for payment much faster than one reading an 800-page tome. The result was a flood of very short reads as authors spread their writing over as many books as possible. On the surface, it makes sense not to punish those who write longer books, and much of the controversy seems to have stemmed from misinformation and confusing headlines. But while Amazon’s new system has solved one problem, it may yet spawn another. Instead of penalising long books, the system could penalise shorter reads – assuming the amount paid per page is the same for any book, regardless of length. 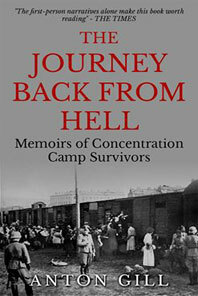 THE JOURNEY BACK FROM HELL is an eBook reissue of Anton Gill’s prize-winning study of the lives of concentration camp survivors after liberation. It is available from Endeavour Publishing and Amazon. I know I’ve mentioned this before but if you haven’t read it and have the stomach for it I think you’ll find it interesting. All these years on, how do the survivors of the most horrific episode in world history regard their wartime experiences, and how have they come to terms with their memories? How did their experience of the Nazi concentration camps change them emotionally, psychologically, spiritually, and politically? And what are their feelings about their former tormentors today? In talking to some 120 survivors in 14 different countries — including political prisoners and resistance fighters — Anton Gill has produced a masterpiece of oral history that is both an account of the survivors’ lives after liberation and a testament to their courage. First published in 1988, each experience of the ‘journey back from hell’ is unique, and readers are free to draw their own conclusions from what the survivors tell them. But the combined effect of the stories is so poignant and important to the core experience of the 20th century that nobody can afford to turn away — or to forget. Today is World Book Day! World Book Day is delighted to work with a huge number of publishers, charities and companies who are as passionate about promoting books and reading to children and young people as we are. Walker Books, publishers of Chris Houghton’s ‘Shh! We Have a Plan’, have a launched a sponsored silence in aid of the National Literacy Trust. On Friday 10 July schools all around the country will be taking part to raise money for our work. Every school that signs up will be entered into a prize draw to win £100 worth of books, courtesy of Walker Books, as well as a signed, limited edition print by Chris Houghton.